Travel West Ukraine Travel West Ukraine: Delicious "Embroidery"
These two pictures made my day today. Both are in Ukrainian style - „embroidered”; both are yummy and beautiful! First one is a photo of sweet Ukrainian breads, call korovays (korovay is singular, korovays are plural). This kind of bread is very special and symbolic for Ukrainians. Korovay has double function in Ukrainian traditions: used as greeting bread for special guests or as wedding bread. In this case, I mean, on this picture, looks like the baker of these delicious goodies run an extra mile, putting this gorgeous Ukrainian embroidery patterns as the korovays design. Looks amazing and, I am sure, yummy! I know a taste of sweet Ukrainian bread – it is normally baked with eggs and raisins, which bring richness to the flavor. And second picture I love very much too! 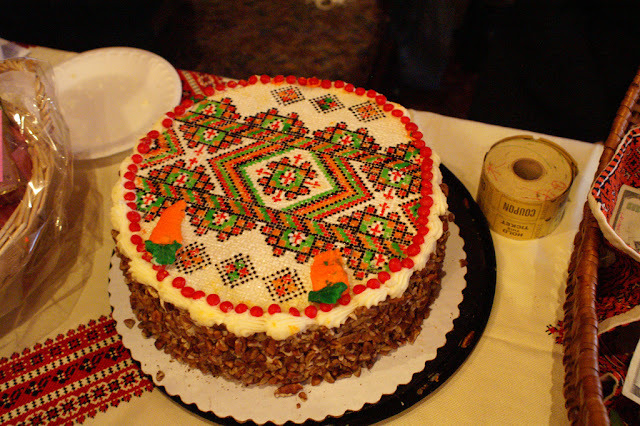 This is a cake baked in Ukrainian community of New York, for some Ukrainian event. As you can see, the cake is nicely „embroidered” with colorful icing. Looks beautifully and so Ukrainian! Happy culinary adventure to you in Ukraine and with Ukrainians!